Ha’Penny Bridge is a Northern California Celtic music band comprised of several musicians from the Chico, California area. 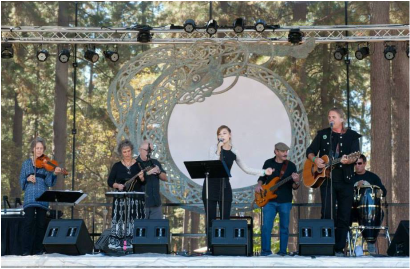 Its dynamic, vocal-driven sound has been described aptly as “California Celtic” due to the band’s unique repertoire and arrangements of Mark McKinnon’s original songs, its stirring adaptations of classic and contemporary Celtic-style ballads, and creative infusion of traditional Irish and Scottish tunes. During its nine-year existence, Ha’Penny Bridge has garnered a reputation as one of Northern California's strongest and most exciting Celtic music bands, including one of the Chico area’s most popular bands. At the very beginning, the Chico News and Review praised it as one of Chico’s hottest up-and-coming bands, and during its successful appearances at the prestigious KVMR Celtic Festival in Grass Valley in 2008, 2009 and 2012, and 2013 Ha’Penny Bridge was hailed for its “rapid rise as one of the North State’s most popular bands” that has “garnered a large and enthusiastic following of music lovers of all ages drawn to the group’s powerful, ensemble-style playing and ringing vocal harmonies.” Since 2009, the band has also been honored every year with Chico Cammie Award nominations as Chico's best world music band, performing (to a rousing standing ovations) at the acclaimed Chico World Festival in 2009 and 2012, headlining at both Sacramento's 2010 St. Patrick's Day Parade and Festival, and Feather Falls Casino's 2011 St. Patrick's Day Grand Opening celebration, and honored to be able to open in 2012 for esteemed Irish artists Karan Casey and John Doyle at Sierra Nevada Brewery's Big Room . Ha’Penny Bridge comprises a lineup of Chico-area musicians with a rich, cumulative pedigree in Celtic and corollary genres. With a frontline of Maya Sieminski-Prosvancz and guitarist Mark McKinnon on vocals, the band includes Jewel Cardinet on mandolin, Vita Segalla on fiddle, Tom Haber on bass, Michael Cannon on keyboards and accordion, and Tony “Dharma” LaRocca on congas. Upon occasion, Ha'Penny Bridge's original vocalist, Molly McNally Paul, rejoins the band for special reunions. The band's versatile range of talent also allows it to tailor its size and sound to fit any size venue and event. "I like this album a lot... I’ve listened to it so often already that I can’t get some of its tunes out of my head, which is a real credit to Mark, who wrote all the songs but one, and to his band, which plays and sings them with affection and skill. Good music begins with good songs, and Mark has an Irish poet’s feel for lyrics and story telling and a California musician’s ability to wrap them in sweet melodies... Some of the songs, like the title tune, are rollicking, and others, like the gorgeous “Holy Ground,” are elegiac. There are love songs (“I Went Out Walking”) and political love songs (“The Running Man”) and even a cowboy Celtic song (“The Blue Winds of Summer”). Give these tunes a couple of listens, and you’ll be humming them in your dreams, guaranteed" (Chico News and Review) and via local airplay. Both CD's can currently be purchased online at CD Baby, Amazon and iTunes. Plans for recording a third CD of new Mark McKinnon compositions are currently in the works. Founder of Ha’Penny Bridge and its guitarist-vocalist, Mark’s first journey to Ireland in 2001 transformed his life dramatically, resulting in his decision to put down his Stratocaster, pick up his Taylor and play Celtic music. Upon his return to the States, he was surprised to discover that his songwriting had undergone a dramatic metamorphosis from rock/folk/world styles to a singular fixation on Celtic themes, history, mythology and a fusion of traditional-world melodic structures. Frustrated by his inability to find an avenue to sing Celtic songs in Chico, he formed his “dream band,” Ha’Penny Bridge, with four members of Chico, California's Pub Scouts and other musicians from outside the Celtic community. His numerous songs written over the last several years comprise most of the band’s repertoire and are featured on the band's two studio-produced CD's. When Mark isn’t singing and playing guitar with Ha’Penny Bridge, he can often be found playing bodhran in Pub Scouts sessions, or dreaming of returning to Ireland’s west coast to sing and play music. As the band’s mandolinist, Jewel’s ability to play melody lines as well as provide driving rhythm is a very special addition to its sound. Among her collection of vintage Gibson “A”-style mandolins is her favorite for performance: a 1923 Lloyd Loar-era “snakehead” Gibson. Jewel is a longtime Chico resident, veteran member of the Pub Scouts, and fixture at Lark in the Morning Music Camp, whose unbridled love for Celtic music and vibrant playing are key elements to Ha’Penny Bridge’s onstage personality. She also loves to visit Ireland whenever possible and is a welcome addition to pub sessions when she is there. Founder of the renowned and longtime Celtic band The Pub Scouts, Michael Cannon has become a Chico musical tradition in his own right. His passion for Celtic traditional and contemporary music resonates in his accordion playing, which has been heard all over Northern California, including Lark in the Morning Music Camp, for nearly two decades, influencing many musicians to embrace and play “trad” music with the same lifelong joy that Michael does. His celebration of the music of Ireland, Scotland, Wales and all places Celtic extends well beyond Northern California to musicians worldwide, many of whom have not only performed in Chico at his behest, but have returned for the hospitality and good cheer generated by Michael’s generous spirit. His influence on Ha’Penny Bridge’s tight ensemble playing and sound signature is profound and immeasurable. Tom grew up playing bass in Berkeley garage bands in the Sixties and credits Phil Lesh as his earliest and biggest musical influence. Over the years, he developed his skills as a member of several blues, rock, country, and swing bands. He was introduced to playing Celtic music when he was asked to join Ha'Penny Bridge in order to provide strength to the band’s “bottom end.” The results have been a perfect fit: his great ear, versatile sensibilities and his instant embracement of Celtic-style music have become one of the band’s greatest assets. In turn, Tom claims that his Ha’Penny Bridge experience has triggered an exciting and unexpected musical renaissance in his life. Vita Segalla, originally from Connecticut, has played the fiddle for much of her life. Her primary emphasis is now on Celtic style music. She has played in many Celtic, contra dance, and contemporary bands over the years, including The Pub Scouts. Vita has also appeared with Sweet Journey at the California World Music Festival in Grass Valley and at the Chico World Music Festival in 2006, and her highly valued versatility on her fiddle has been a featured attraction in various Chico-area theatrical productions. She says that Ha'Penny Bridge is an exciting band for her due to its unique blend of Celtic and folk styles, and because its uptempo sound offers many opportunities for her to explore creative nuances on her fiddle. As is the case with some of his fellow bandmates, Dharma also experienced a conversion to Celtic music after an exclusive life of rock and reggae-driven music. However his percussion background in rock and world music, and his half-Scottish ancestry, eased his transition into becoming a driving force of the bottom of the band’s varying Celtic-style rhythms and time signatures. His incessantly upbeat personality and inventive approaches to his congas help to fuel the positive spirit existing throughout the band’s songs and tunes. Maya joined the band in late 2012 and brings a lovely presence to the band's vocal stylings. Before she had ever imagined the possibility of ever being a member of Ha'Penny Bridge, the singer-songwriter had fallen head-over-heels in love with the band's sound and repertoire. With an absolutely sweet tone and amazing range, Maya 's voice carries a Celtic lilt that some listeners claim echoes to the likes of Cara Dillon and Kate Rusby. Named Chico's best female vocalist in Chico's 2009 Cammie Awards, Molly’s chance meeting with Mark McKinnon in 2006 not only resulted in their forging an instantly strong, harmonic bond as Ha’penny Bridge’s singers, it also introduced this gifted vocalist to the world of Celtic music for the very first time. From the very beginning, as she drew on her previous experiences of singing folk and gospel music, her bandmates knew her voice was a galvanizing force to the band’s material (as can be heard on the band's first two CD's), especially her lilting harmonies, which add a strong flourish to the band’s unique musical signature. Most importantly, though, Ha’penny Bridge’s enthusiastic audiences are drawn to and mesmerized time and again by Molly’s radiant stage presence and lovely voice which course gracefully through the heart of Ha’penny Bridge’s performances. The band is thrilled that this highly respected flute and whistle player joined the band's lineup. Formerly of the popular Sacramento Celtic band Nine-Eighths Irish, Bo's elegant and melodic playing adds a lovely quality to the band's songs and tunes. He and Mark met and became friends years ago during sessions with Chico's Molly's Favourite band, and their dream of teaming up as band mates was finally realized in 2011. The band treasures his presence, which has been an integral element to elevating its sound both onstage and throughout its At Fiddlers Green CD. Rebekah’s fiddle playing adds a delightful dash of incendiary spice to Ha’penny Bridge’s sound. Classically trained as a violinist and the possessor of a sweet harmony voice, Rebekah’s journey as a fiddler has traversed Celtic, swing, bluegrass, and the blues, all the while maintaining her roots in classical sensibilities. The result of her evolution is a heady blend that touches on all of those genres, driven by Rebekah’s unmitigated love for Celtic music that blazes at the core of her fiddling. Her joining Ha’penny Bridge actualizes her and Mark’s longtime desire to one day be band mates in a vocal-driven Celtic band. As a longtime fixture in the Northern California Celtic music community, Del is both a highly respected percussionist and, in the opinion of Celtic drummers who own them, a skilled maker of some of the finest bodhrans in the world. When Del and Mark became friends and fellow bodhran partners at Lark Music Camp several years ago, neither could foresee circumstances that would bring Del into the Ha'penny Bridge family. They and the rest of the band were overjoyed when he agreed to join the band in 2012, and his drumming on traps, cajon, djembe and bodhran has added a wonderful element to the band's already powerful rhythm section. Hands down on of the most highly respected drummer-percussionist in the Chico area, Zach's amazing versatility and range enable him to play nearly every type of music on any type of drum. His positive and infectious love of life and music infuse every band he plays in with uncommon passion and fire, which is why at one time or another, almost every top Chico-area band requests his services. His deep admiration for Celtic and world music has drawn him closer into the Ha'penny Bridge ranks, and the band is honored that he has been joining them onstage with increasing regularity. Curtis Paul adds amazing depth to Ha'penny Bridge's rhythm section. One of the most versatile musicians in the band, Curtis is a superb drummer-percussionist whose rock and folk sensibilities add surprising and powerful elements to The Bridge's performances. His recent conversion to joining the band's Celtic-world journeys is an exciting development, especially as he and his wife Molly share the rapture of performing together. Widely regarded as one of the Sacramento Valley area’s finest drummers, Jimmy Fay is a musical legend in the Chico area. His unbridled love of world music – be it Celtic, Afro, Latin, Reggae, Ska, Rock, and various hybrid genres – resonates throughout his dynamic and mesmerizing playing, as well as in his passionate vocals. Being that Jimmy’s talents are in constant demand, Ha’penny Bridge is honored by his transformative, joyous presence and on-stage dynamics whenever the occasion calls for this gifted drummer to join the band. © 2008, 2009 Mark McKinnon. All Rights Reserved.